I don't know about you but I absolutely adore citrus flavours. You name them, I love them. Especially lime, lemon, orange and mandarin. I just adore the zingy, zesty, tangy, freshness of citrus and the myriad of ways that they can be used in baking. 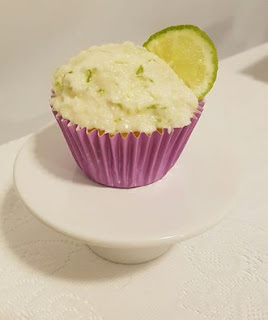 Citrus fruits are not overly expensive and you seldom need to use a lot of them in a recipe, making them both a tasty and affordable flavouring option. I created this recipe yesterday when I was craving a touch of summer after a day of gloomy grey skies. These cupcakes have the most wonderful flavour, texture and tang and they smell divine. I hope you enjoy them. 1. Preheat oven to 160 degrees. Place rack in the centre of the oven. Place cupcake liners in a 12 hole muffin or cupcake tray. 2. Place all ingredients into the jug with the kneading blade, in the order listed. Select the Pastry P1 program. 30 seconds before the end of the program, stop the machine and scrape down the sides. Restart the program. 3. Once program is complete, carefully remove the kneading blade. Then fill each of the cupcake liners 2/3 of the way to the top. 4. Place the tray on the centre rack of the oven and bake for 18 - 22 minutes or until a skewer or toothpick inserted in the middle comes out clean. 5. Remove cakes from the oven. Allow to cool in the tin for 5 minutes then remove to cool on a cake cooler. 1. Place butter in the jug with the kneading blade. Select speed 3 Temp 90 Time 1 minute to melt butter. 2. Place icing mixture, coconut, zest and half of the juice in the jug with the melted butter. Select Speed 4, Temp 0, Time 15 seconds. 3. When complete, check the consistency. It should be thick but spreadable. If it is two thick add a little more lime juice, a teaspoon at a time and mix for 5 seconds until the desired consistency is reached. 4. Once the cakes are cool, spread the icing mixture over the tops. Garnish with a small slice of lime if desired.